The Rainbow Buzzer is tied with multi-coloured thread which is always changing colour when wrapped round the hook so you will never get two identical patterns. Thread : Rainbow Ice Crystal tinsel or Midge Metallics. Breathers : White siliconized polypropylene yarn (Niche Products). 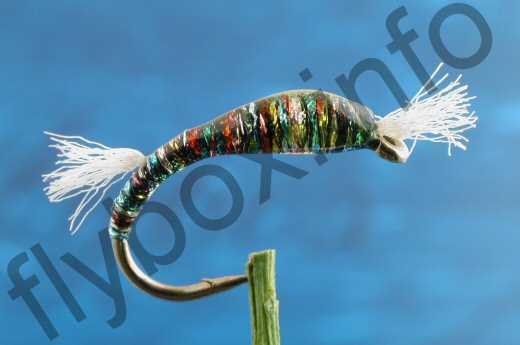 Body : Rainbow Ice Crystal tinsel or Midge Metallics. Coat the Body with epoxy resin. Shrimp. Currently there are no comments about the Rainbow Buzzer fly pattern from other fly fishermen yet.